This event is at the Red Cross Museum in Geneva, Switzerland until 24 January 2010. I attended this exhibit when it first opened in September and I was surprised by the photography which was shown. 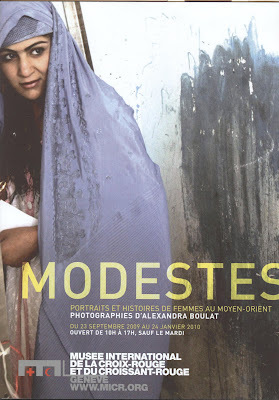 Alexandra Boulat (the featured photographer) portrayed women in the middle east in less of an orientalist view then most European photographers. The images represented the less admired aspects of some women's lives in the Middle Eastern region with photos showing Middle Eastern men and women who became transvestites, women in hospitals with acid burns, women in poverty...over all, it was a very disturbing collection. It continued to portray Middle Eastern women as helpless sufferers in the name of Islam. The title of the exhibit was very misleading. Modesty is usually considered a beautiful thing but instead, this exhibit portrayed modesty as an involuntary result of suffering. Maybe other people saw the exhibit in a different light, but in my opinion, it could have exhibited at least SOME of the beautiful aspects of Modesty in the Middle Eastern region.